We are now running 5 childcare centres in East Bangalore. Around 200 children aged 2-5 years attend the centres. Most of them come from troubled and under-privileged backgrounds. We recognise the importance of providing the children with valuable opportunities and experiences in these crucial formative years and aim to prepare to instill in them a positive attitude towards holistic education. The childcare centres support working mothers by providing a safe place for their children during the day. 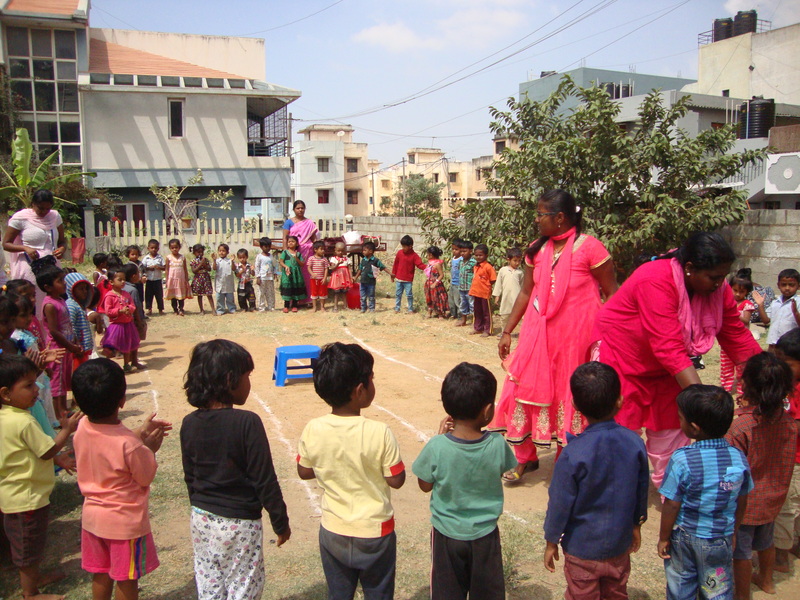 At the centres, we engage the children in creative and physical activities. Songs are taught in different languages to improve the children’s vocabulary and communication skills. With the use of visual aids and interactive games, we focus on teaching numbers and the alphabet. It helps the process of learning to read and write and prepares the children for formal schooling. The habit of school attendance and social skills are nurtured in the children. The parents also learn to appreciate the importance of education. At Concerns, partnership with the community is considered essential for the all-round development of children. Parents are asked to send in one cooked meal with their child each day. This allows us to monitor their involvement in the child’s nutrition. In addition the centre provides one wholesome serving of food. The children are taught good eating and hygiene habits. We hold regular parent-teacher meetings to raise awareness on health and child nurturing practices. All the children undergo medical assessments including height and weight checks. The children are given Vitamin A, polio immunization drops and annual worm medication. Our childcare centres are supported by KSCCW (Karnataka State Council for Child Welfare) and Rajiv Gandhi National Crèche Scheme. In May 2016, Thomson Reuters volunteers organized special activities for children at one of our centres.